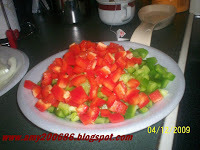 Pour an amount of vegetable oil on the skillet, add the garlic and onion powder, then, sautee the chopped onions and green/red bell pepper. Cover for a minute. 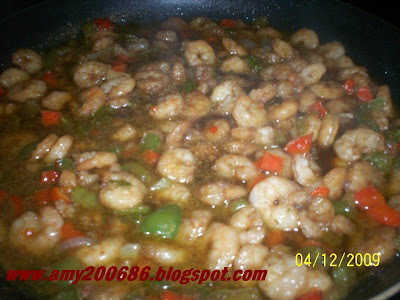 Add an ample amount of Datu Puti soy sauce depending on how saucy you want it to be. Add some salt to taste. Cover until it boils. 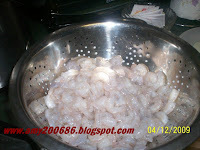 Then, add the shrimp, cover until the shrimp is done. 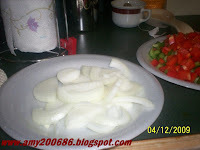 Serve with hot white rice. 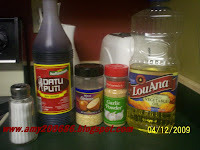 Datu Puti Lapu-Lapu soy sauce is available in FILIPINO STORE.